Cameron Smith and Marc Leishman celebrate another birdie. JARROD Lyle was remembered at Melbourne's Metropolitan Golf Club with wife Briony and daughter Lusi greeting the Australia and US teams on the "Lyle Mile". The two teams were met by two bags on the seventh tee - one in memory of Lyle and the other Peter Thomson, who passed away in 2018 - with Briony and Lusi embraced by all players. 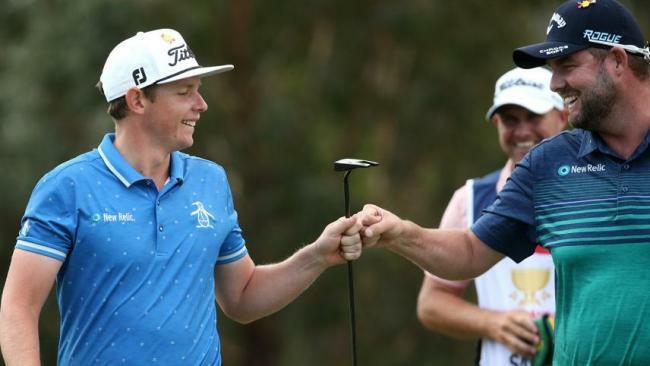 The Lyle Mile was a par five at last week's Australian Open. It is also being used at the World Cup of Golf and next week's Australian PGA Championship to recognise and remember Lyle and raise awareness for Challenge, which supports children with cancer. "I knew she was going to be out here - I didn't know which hole," Leishman said of Briony. "Obviously it's terrible what she's going through at the moment and what she has been through, especially to have Lusi out there as well. "It was a tough moment, but she's doing it a lot harder than we are, and if we can help her with that, that's a good thing. It was nice to see her. "It was nice to get that tee shot away, to be honest. It was a tough tee shot." 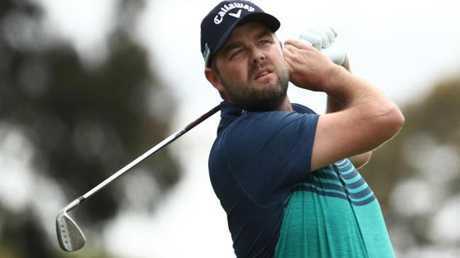 There's a three-way tie at the top, with England and Korea equalling the Aussie team's round of 10-under 62 as the feared fierce weather failed to show up and low scores prevailed. Marc Leishman said seeing Briony Lyle was tough. WE'VE all had bad days on the golf course. 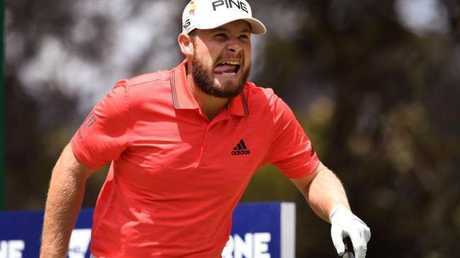 But Englishman Tyrrell Hatton had already planned his remedy as he made the way off the 18th at Metropolitan. After a "frustrating" back nine to forget, Hatton thanked his lucky stars that partner Ian Poulter was able to carry the can to keep England in the mix at six-under, four shots off the leaders. And he knew a particular double would be just what the doctor ordered to turn his fortunes. 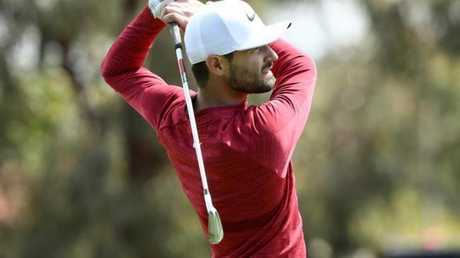 "We have made a decision (on who will play which holes today), although with how I played the back nine, it might be discussed later on seeing as I can't actually hit a green at the moment," he said. "Back nine's made me pretty grumpy. "I'm going to go in the jacuzzi, that's all I'm going to do, and eat a nice big steak." Tyrrell Hatton had a tough day. THE phone call to play in the World Cup was welcomed by all, but none more so than Joseph Naffah. The Venezuelan, who paired with countryman Jhonattan Vegas, described the call-up as a "gift" after severe spinal injuries threatened his golf career more than 30 years ago. "It's been a long road for me as a person, because I struggled with some heavy injuries in my spine," he said. "I'm just going to try and enjoy the moment, every single one of it and play golf, which is what we do. No expectations." Naffah, 49, first injured his back 31 years ago. "I was in college. I slipped a bone, and then after that I did everything I could to avoid surgery. Got infected with some injections, which I was very unlucky, and that kind of killed my golfing career," he said. "At that point, golfing was out of the question and I just wanted to get healthy to be able to create a family and all that. God gave me that, I created a family, three beautiful children, and I feel pleased." 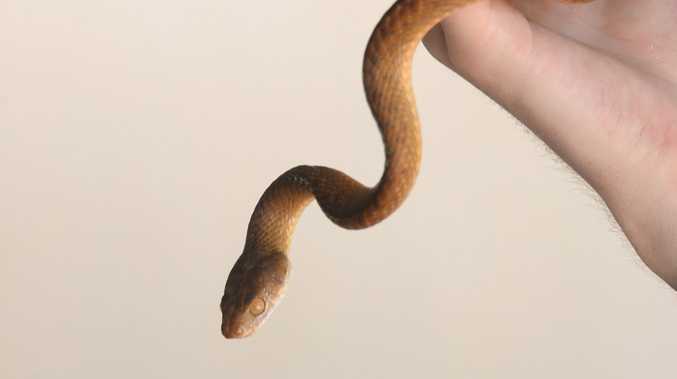 Kyle Stanley is teamed up with Matt Kuchar for the USA.